As a member of Sororitas choir, based in Cardiff, I along with many other choirs across the city and beyond were invited to take part in a ‘Mass Choir’ as part of the City of the Unexpected. So after learning the songs (two newly written pieces and some medleys) and one slightly mad rehearsal with everyone, we were being set loosen the city of Cardiff along with the other performers. The point of the event, as organisers kept insisting was the ‘unexpected’ but as choir performers we were kept at the castle (not unlike the prisoner Mr Fox) and missed out much of the early action. So mainly relying on rumour and, well Twitter, we discovered the peach had indeed landed and was heading in our direction. Eventually we heard it (who knew a peach would be so loud?) accompanied by a marching band and a band of protesters, we spotted the giant fruit heading our way. 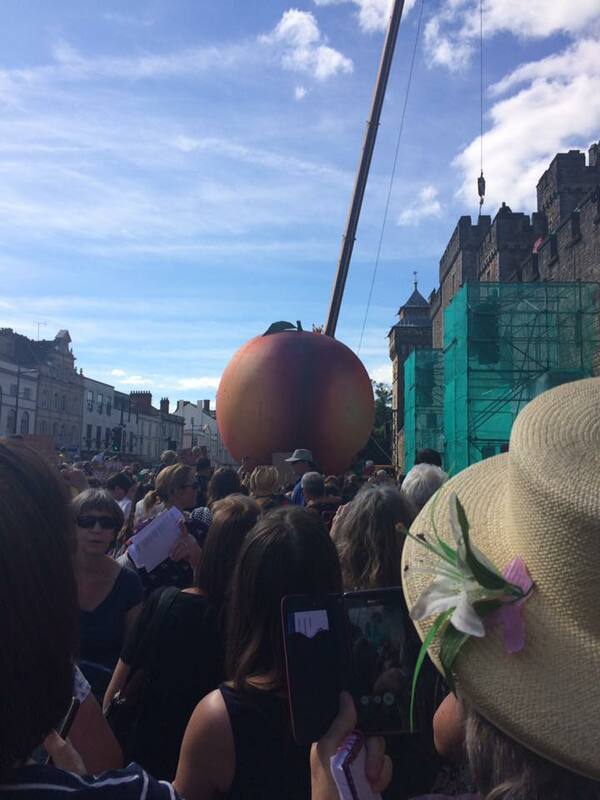 The peach slowly arrived and was tethered to the front of the Castle, presumably to stop it escaping and causing more havoc…Accompanying it were protesters who demanded that we ‘Save the Peach’ and although we weren’t originally part of that group, the choirs couldn’t help but join in the rousing cry to ‘Save the Peach’. The protest crowd was made up of children and their adults, showing, much as Dahl would have wanted, kid power really works! Some brilliant signs accompanied the Peach such as ‘Make Fuzz not War’ and ‘Peach Peace’, so after an impromptu Peach Rally (choirs really do like to ‘join in’ we settled in to welcome the peach). The Peach was then formally welcomed by the Lord Mayor. While the peach was being welcomed we were slightly distracted by Mr Fox and his family who seemed to be using the ramparts as a bit of a playground! Some acrobatic moves as Mrs Fox and Mr Fox ducked in and out of the castle, presumably while hiding from some angry farmers. From our spot on the grass in front of the castle the choirs had a fantastic (pardon the pun) up close view of the acrobatics! Meanwhile things were happening with the Peach, noises seemed to be coming out of it and the Fire Brigade sprang into action, quickly lifting what looked like a young boy from inside the peach. While the Chief of Fire services got to work rescuing those inside, it was time for the choir to do what we came to do. Singing a medley of Welsh classics to welcome the visitors from the peach. This is the kind of thing choirs live for, the chance to sing with about 500 other Welsh choristers, in front of Cardiff Castle, singing Welsh songs? That was a once in a lifetime opportunity, and one we’re all thankful to Dahl for giving us! The crowd joined in with the songs as various animals- Ladybird, Grasshopper and Spider-were also winched from the peach. Ending with a rousing version of Catatonia’s International Velvet the creatures were formally welcomed to the City! They thanked the crowd and were on their way to the next adventure. Meanwhile Mr Fox and family had been waiting for an opportunity. 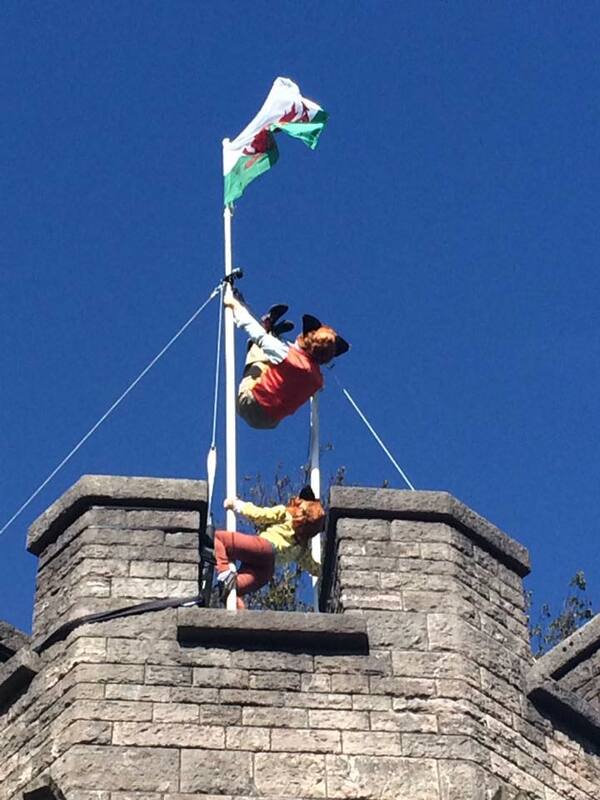 With some more flagpole acrobatics, things seemed to be building towards some sort of big climax…however this moment ended in disappointment, as Mr Fox was unable to escape across the tightrope between the Castle and Queen Street due to crowds’ bellow. Despite the organisers’ best efforts, the crowd couldn’t be persuaded to move, and so the big centrepiece of the day ended on a slight note of disappointment. There has been a variety of comments on social media about crowds/crowd control and organisation at the event. And while it’s fair to say the ‘main events’ at the castle were very crowded, it was to be expected at such an event. Being a ‘part of the action’, I can say that yes there was an element of disorganisation felt at times, but given the scale of things, that isn’t surprising. All day however I was always in sight of several security and event staff at all times who did their best to help out. I didn’t use the App that signalled where things were, but I found that simply wandering around the city you found events popping up everywhere. And actually these smaller surprise events were sometimes far more rewarding to watch than the ‘main attraction’. It was frustrating that people as a group took out their frustration on one another, pushing and shoving and creating more of an issue in the crowds, rather than trying to cooperate and help one another, and the event run smoothly. 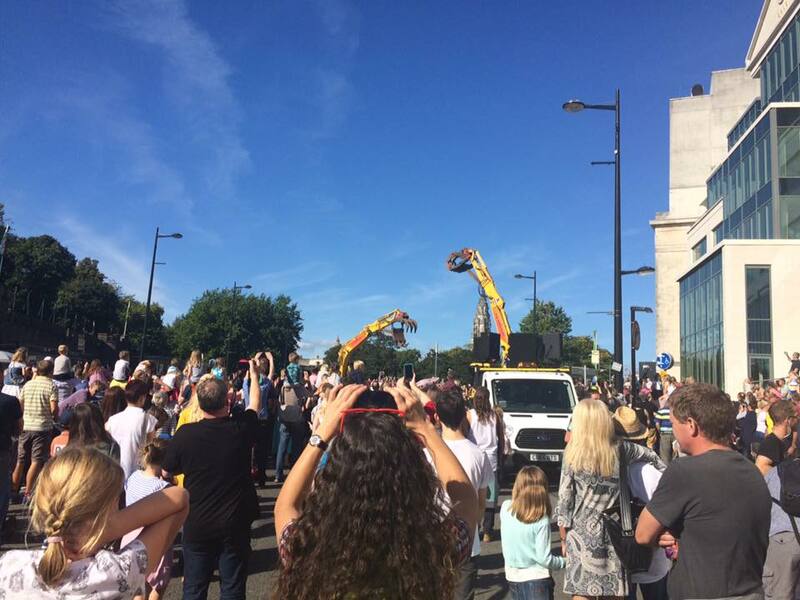 So on that note, I feel sad that the crowds, not the organisation meant that Mr Fox didn’t complete his stunt as planned. However, as was the spirit of the event, those who later were wandering by the castle were rewarded with an unexpected Mr Fox tightrope walk later in the afternoon-and pretty impressive he was too! While smaller ‘happenings’ took place all over the City Centre, including an impressive Digger Ballet, where Mr and Mrs Fox insinuated something a bit less child-friendly through their ‘digger dance’ to ‘Why Don’t We Do it in the Road’-not sure Paul McCartney ever saw two human sized foxes driving diggers to that song, but stranger things were happening all over town at that point. Mr Fox, seeming to get about a bit, was ballroom dancing in the museum, playing the Organ in St John’s Church and playing the violin in Castle Arcade. When Mr Fox wasn’t drawing crowds George and his marvellous medicine machine and some interesting Polar Explorers were also out and about. 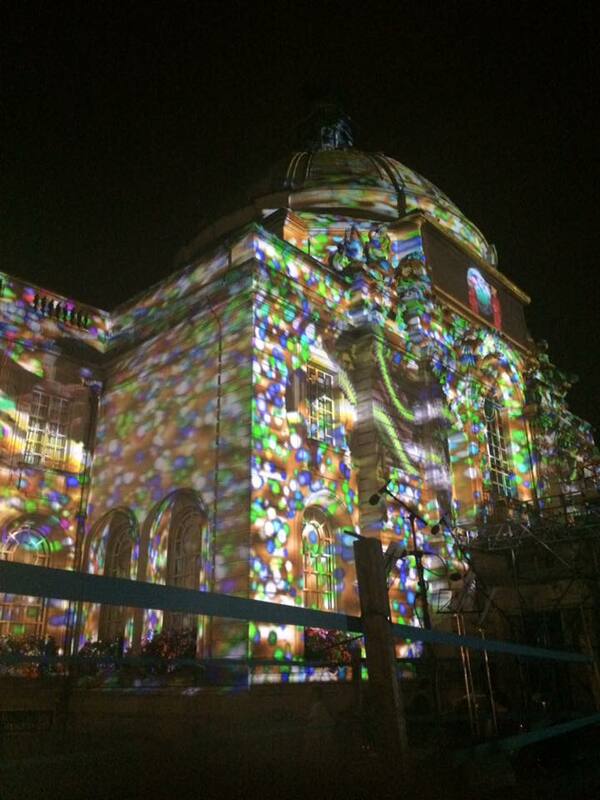 Eventually the city quietened down briefly and we could all draw breath before the evening performance. 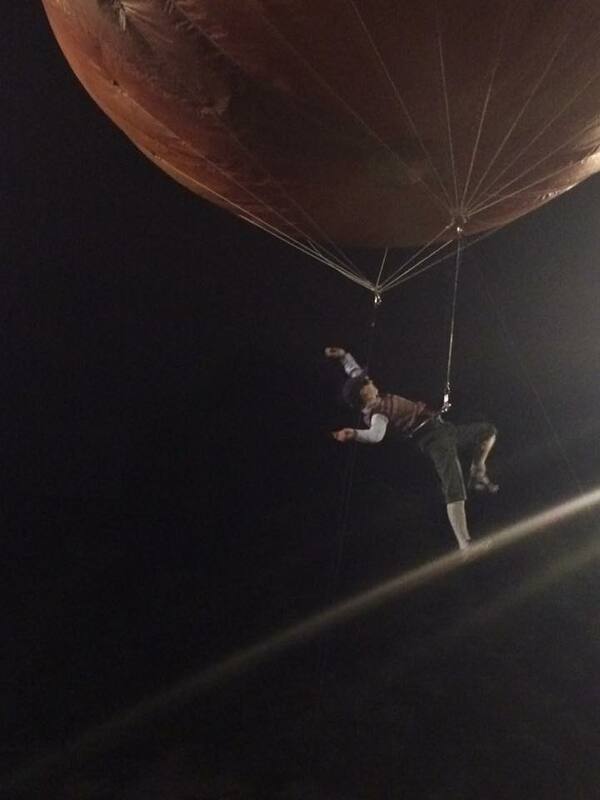 The evening performance was both lavish and surreal. Taking place at City hall it was a celebration of the marriage between the Ladybird, and her rescuer from earlier that day, the Chief of Fire Services. The choir’s part in this was to sing to the newlyweds a medley of love songs, so we weren’t needed for the first half, and as a result were hidden out of sight at the side of City Hall. As with much of the choir’s waiting points, this proved a sneaky advantage in getting a clear and alternative view of the proceedings. Just before that however, a few of us had our own ‘unexpected’ discovery, which showed, I think that the real magic wasn’t in the big crowds or events, but what you stumbled across. 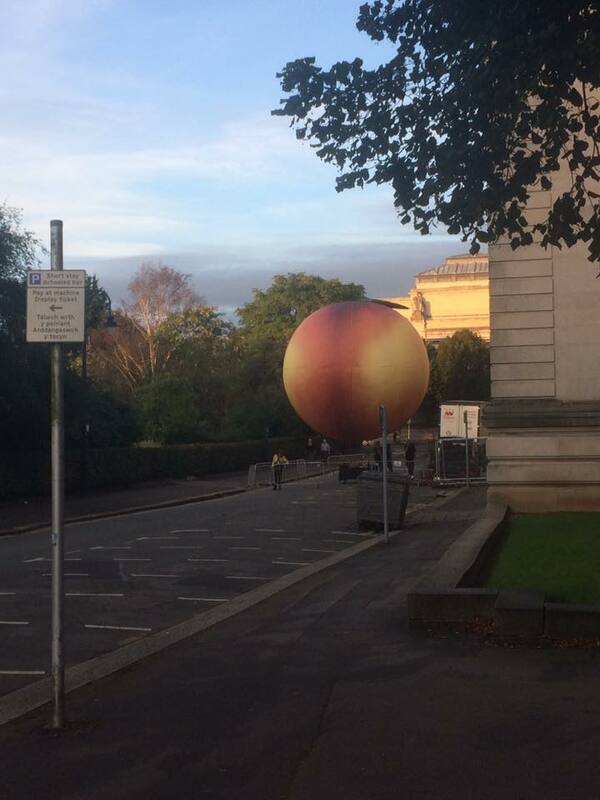 Having just got excited at finding where the vintage cars were ‘sleeping’ between performances, and having admired the vintage Morris Minor, two of us choir members stumbled on a Giant Peach floating quietly on its own behind City Hall! With hardly anyone around it was really magical to have a quiet moment and admire the truly impressive piece of set that had been created. City Hall was decorated lavishly as a wedding venue, with the Bridal party on the roof, while dancers, orchestra and now choir gathered beneath. 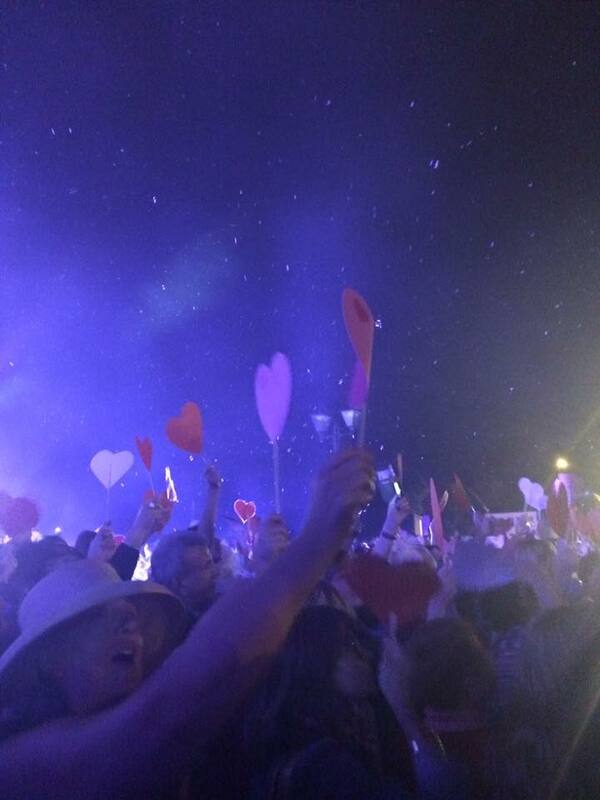 Singing our way through love classics ‘Love is in the Air’ ‘All You Need is Love’ ‘When a Man Loves a Woman’ and ‘Do You Love Me’ all with accompanying dance moves, confetti and paper hearts, again got the crowd singing along. And then we all turned and watched a Ladybird marry a fireman, accompanied by rock guitar solos on the rooftop, flanked by ballerinas. Finishing the romantic moment was singer Sophie Evans hoisted up on a platform singing ‘What a Wonderful World’ (which hopefully wasn’t drowned out by the snow machine for the rest of the audience as it was for us!). The wedding party then departed and something strange started to happen to City Hall, video projections and sound scaping began to leap around, and the building was covered in chocolate and sweets in all manner of configurations. A display that Willy Wonka would be proud of, and one of the most visually impressive moments of the day. 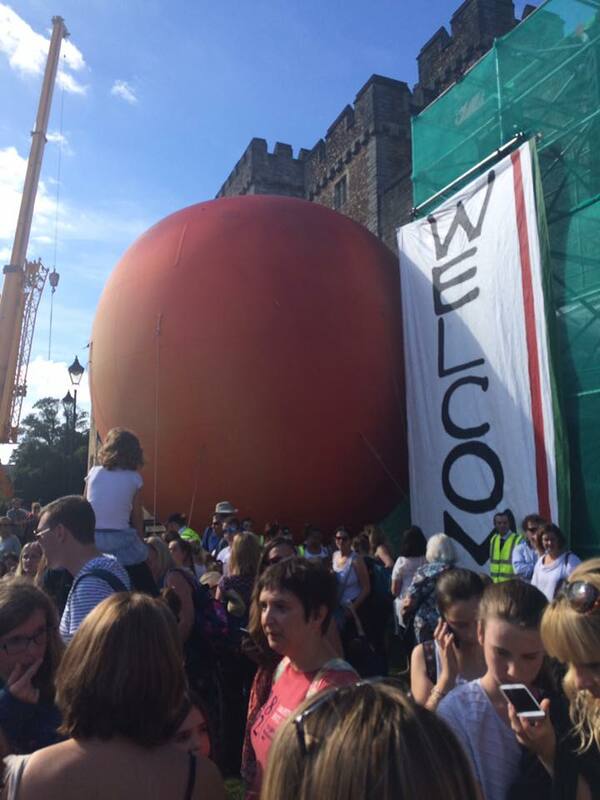 As the choir then left, and a few of us made our way back away from the action, one of the most truly magical moments of the day happened, on an entirely deserted Lloyd George Avenue, a Giant Peach with James himself suspended from it floated towards us. On a street with only two of us seeing him float, practice his moves and drift off towards his entrance was truly unexpected and a perfect end to the day. We might have missed the finale and fireworks, but being a part of the City of the Unexpected gave us a really magical moment to end the day.